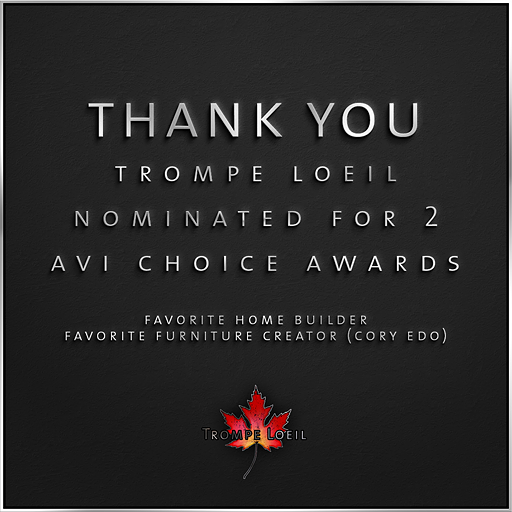 We are very honored to announce that Trompe Loeil has been nominated by our customers in two categories for this year’s Avi Choice Awards! In the Home & Garden category, Trompe Loeil is currently in the running for Favorite Home Builder and Favorite Furniture Creator (Cory Edo). We’d like to thank everyone that nominated Trompe Loeil in these categories – it means so much to know that our customers appreciate us as much as we appreciate you! If you’d like to vote for Trompe Loeil in either category (or both), you can do so at this link – just hit the “Vote” button at the end of each category listing to register your vote. Voting closes on December 13th and the winners will be announced on December 15th. Again, thank you so much for your nominations, your votes, and your patronage, and thank you for a wonderful year!